Each charm is a reminder of the promises the Lord has made to mothers. While putting this bracelet together I couldn’t help but think of that amazing and terrifying time when I became a new mother. I was so overwhelmed and had so much to figure out. I learned to rely heavily on the Lord. For me, the charm bracelet has become a kind of pep talk on my wrist. Each charm helps remind me of who I am and the many ways the Lord helps me. Learn the meanings behind the charms. This is for the bracelet shown above. If you would like to add the initials and/or birthstones for children, see below. 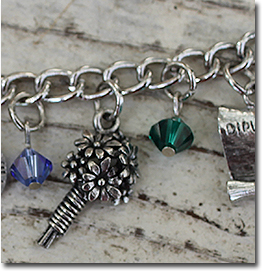 Give your bracelet a personal touch by adding an initial and/or a birthstone for each child. If you are ordering more than one bracelet, be sure to explain which extras belong with which bracelet. Visit my customization page to see a full list of my dangles, how they are added, and instructions on how to make special requests. List which letters you want. If you would like them grouped with a certain dangle, include the dangle ID# next to it.